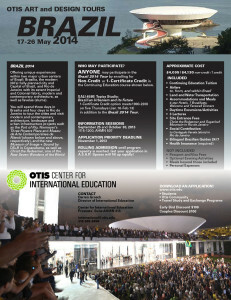 OTIS’ Architecture/Landscape/Interiors Department, Center for International Education and Continuing Education Division are pleased to announce OTIS Art and Design Tours: BRAZIL 2014! OTIS Art and Design Tours: BRAZIL 2014 will offer unique experiences within two major urban centers of Brazil: Brasilia, the modern (60’s) fully-planned city and Capital of Brazil, and Rio de Janeiro with its extant Imperial and Colonial fabric, modern and contemporary architecture as well as favelas (slums). Participants will spend three days in Brasilia and four days in Rio de Janeiro to tour the cities and visit modern and contemporary architecture, landscape and urban infrastructure projects such as the Port of Rio, Niemeyer’s Three Powers Plaza and Museu de Arte Contemporânea de Niterói (shown below and above, respectively), and the new Museum of Image + Sound by DS+R in Copacabana, as well as Christ the Redeemer, one of the New7Wonders of the World. ANYONE (faculty, staff, alumni and the general public) is welcome to participate for Non-Credit OR 1-Certificate Credit. 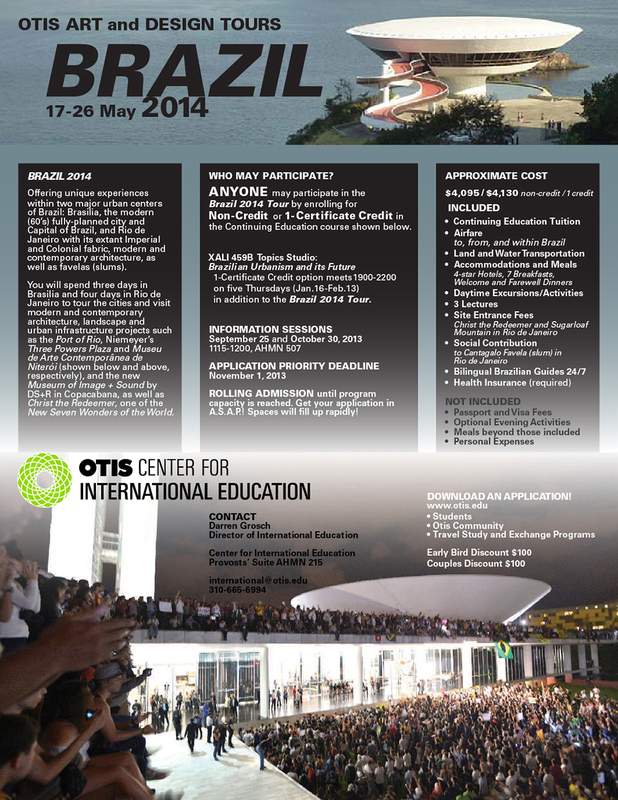 Anyone may participate in the BRAZIL 2014 tour by enrolling for Non-Credit or 1-Certificate Credit in the OTIS Continuing Education course Brazilian Urbanism and its Future. The 1-Certificate Credit course option meets 1900-2200 on five Thursdays (January 16 –February 13, 2014) in addition to the BRAZIL 2014 tour, May 17-26. The Non-Credit Option consists of the BRAZIL 2014 tour, May 17-26, ONLY. For a preliminary taste of Brazil, watch and listen to a concert in an amazing site overlooking Rio de Janeiro!